September 6, 2018, Thekchen Chöling, Dharamsala, HP, India – Once seated on the throne this morning, His Holiness the Dalai Lama announced that he had decided to give the permission of Avalokiteshvara, Liberating Beings from the Lower Realms. In conjunction with that, he said he would also conduct a ceremony for taking the layperson’s and bodhisattva vows. However, first of all, while the prayers and recitations were being done, he would conduct the necessary preparations. Thai monks first chanted auspicious verses in Pali. They were followed by a mixed group of monks, nuns and laypeople who chanted the ‘Heart Sutra’ liltingly in Vietnamese. The ‘Heart Sutra’ was then recited again in Indonesian and was finally declaimed once more in English by a group from Singapore. His Holiness began by quoting from Aryadeva’s ‘400 Verses’ as a guideline for the day’s discourse. His Holiness referred to the three or four bodies of the Buddha, which can only be attained by cultivating the appropriate causes. He explained that the path taught in the Sutras can give rise to the Truth Body of the Buddha, but that the path resulting in the Form Body is only found in the Tantras. “Understanding things as they are is an antidote to ignorance. Understanding dependent arising gives rise to an understanding of emptiness and uproots ignorance. The Form Body, which is of service to others, emerges from within emptiness. Without attaining the Truth Body, you can’t achieve the Form Body, so first aim for the Truth Body. “In the past, there were people who asserted that the Perfection of Wisdom teachings were not taught by the Buddha. Similarly, others asserted that the teachings of the Sanskrit tradition as a whole were not the teachings of the Buddha. These assertions are challenged in Nagarjuna’s ‘Precious Garland’, which maintains that bodhichitta, the six perfections and emptiness were taught directly by the Buddha. “The Four Noble Truths, their sixteen characteristics and the 37 Wings of Enlightenment, revealed in the foundational teachings of the Pali Tradition and held in common by all Buddhist traditions, are explained in elaborate detail in the Sanskrit Tradition. Nevertheless, it is not enough to declare that the teachings of the Sanskrit Tradition can be attributed directly to the Buddha; the real question is whether they stand the test of reason and logic. “Since some Indian scholars have suggested that the Tantras were not taught by the Buddha, because similar practices, fire rituals and so forth, are observed in Buddhist and non-Buddhist tantras, I asked my teacher Khunu Lama Rinpoche to explain how the traditions may be distinguished. He clarified that it is not whether the practices involve the use of the channels, energies and drops that makes the difference. The distinguishing factor is that In Buddhist Tantras they are employed in the context of understanding emptiness. “I’ve heard of Indian Sadhus who, living naked high in the mountains, cultivate the practice of Inner Heat. They also practise transference of consciousness. It is my hope and wish to meet some of these accomplished meditators to discuss their experiences with them. His Holiness remarked that he did not know if Shantarakshita and Kamalashila wrote about tantra, but subsequent Tibetan translators who visited India did. Among them was Marpa Lotsawa who studied and trained with the adept Naropa. He had previously been a scholar at Nalanda University where he was gatekeeper of the northern door. As he began to give the permission of Avalokiteshvara Sarvadugati Parishodana, Avalokiteshvara who Liberates Beings from the Lower Realms, His Holiness observed that the practice came from Mitrayogi, who received it directly from Avalokiteshvara, via the collection of visions of Thagphu Dorje Chang. 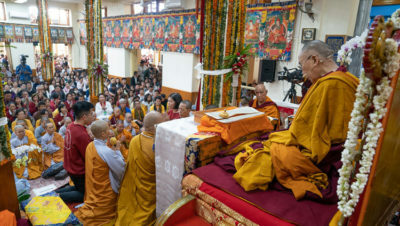 His Holiness told the audience that he had received it from Kyabje Trijang Dorje Chang and that during the retreat he had undertaken in connection with it he had recited 600,000 six syllable mantras. In the course of the ceremony His Holiness gave the layperson’s vows and the bodhisattva vows. When the permission was complete he took up the ‘Buddhapalitavrtti’ and requested the members of the audience to remember where he had reached in reading the text.